As teachers we are so busy and we need to make quick observations and decisions about our teaching and student's learning. It is no secret that I love color coding to help me accomplish this! Who is rapidly working through the work. Who is struggling to get through the work. Who is stuck on a particular slide or concept. Over half the class is on the green slide. Maybe now is a good time to clarify the green slide. Use one color that fades or gets darker as the slides go on. 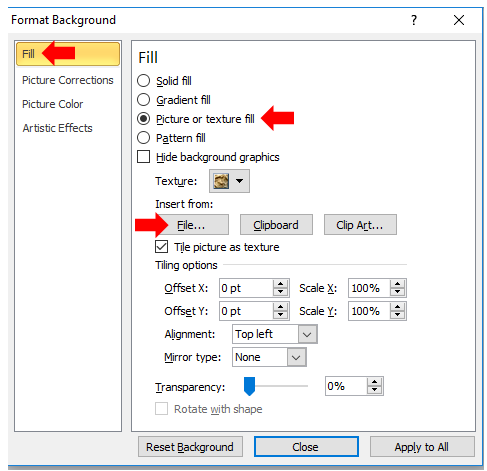 If there's not an obvious feature of your slides that repeats, add in clip art that can have different colors on each slide as seen below. Try it today and let me know in the comments below how it goes! You'll never go back to not using this strategy. Do you want more color coding strategies? Check out my Color Coded Weekly Grade Log by clicking here. I use it ALL. THE. TIME because it gives me so much data for student growth without requiring me to comb through massive amounts of numbers. You can learn a lot about a person when you learn about where their name originates. I have often done an activity in my classroom where students share about their names. There are some interesting stories out there from being named after famous people, immigrants, and family history! I have always been luke-warm about my Teachers Pay Teachers store name. When I introduced myself and my store name at the TpT conference in Nashville, I felt I had to give the back story. Other seller's positive reactions made me realize how cool my (and other's) store names are! Read on to find out how your favorite sellers got their store names! Then, fellow teacher-authors, feel free to add your story in the comments below! When trying to come with a store name, I wanted to think of something that represented who I am beyond teaching. Since I was a kid, my parents always called me "Stef" and as an adult my husband calls me "Bub". I put them together to get "Stefbub"! I am a Certified Occupational Therapy Assistant (COTA) For years when I made things for my students, colleagues would say "you are so creative". It was usually followed by "can you make me...". When I thought about starting a store, coming up with a name seemed so random, then CreativeCOTA popped into my head. Usually things pop right back out, so I am glad this one stayed. For over 30 years the special needs students that I love and service have called me "Mrs H" and the teachers tell them to go to "Mrs H's Speech Room". My store name evolved from that because it makes me happy and reminds me of why I am sharing resources. So that other students can happily run down the hall to "Mr/Mrs ____'s Speech Therapy Room" and have fun while they are learning. During my many years of teaching (grades K-8) I've been committed to outwitting the issues faced by gen. ed. teachers. These issues include delivering lessons and materials that address differing levels of learner sophistication, special education, English language learners, emotionally impaired students, speech and language, absent students, etc. The general education teacher is challenged to successfully teach all of these learners, align to common core standards, and keep admin. happy too. So my store name reflects that mission. "Smarter Teaching K-8." Colleagues would say that I 'teach wisely' instead of giving busy work. I just wanted to maximize exploration time for students and minimize the generation of things to mark, lol! I was labelled gifted myself so apparently that means my brain works a bit oddly, making connections rather than learning in a straight line. I tend to present information the same way so kids will learn in a way that let's them internalize and then guess at connections down the line (which I encourage). The description stuck. Mine came after seeing these cute little circles that I used to make my teaching icon. I thought they looked like little gears. I always think of gears as little building blocks or mechanisms that make something like a clock work. I also connected that to the saying of the gears turning can refer to someone thinking deeply. Since I draw clipart, my brain somehow related that as clipart being the gears that help make a product better. It made sense to me at the time. The name doesn’t have anything to do with education, but anytime I see or say my store name, it reminds me of that afternoon with my family. Which is a great thing to be reminded of. I do write content to align with the Louisiana ELA guidebook....so I guess there is a little connection there. My store name "PLANETPALS" is based on my characters Planetpals from my site at Planetpals.com. With Planetpals I have been educating students worldwide since 1998. It was the first environmental education resource online. Planetpals are Earth friendly and fun characters that are for Healthy Planet and Healthy People. The topics of my sites, my blog and my content on TPT are related to Green Living, Healthy Planet, Earth Science, Healthy Lifestyle and World Peace. Would you like to share where your store name originates? Please share in the comments below! 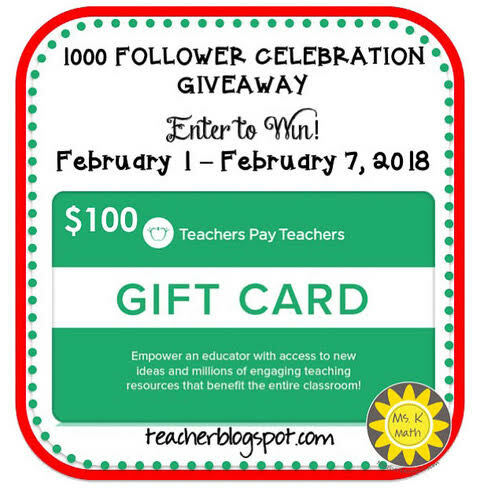 This giveaway was organized by Ms. K as a celebration for gaining 1,000 followers in her TPT store and to say thank you to all of her followers for their support. Use the Rafflecopter below to enter. Giveaway will begin February 1st and end February 8th. It was my senior year in high school and I was in an Anatomy and Physiology class. We were nearing the end of the course preparing for our final exam. When my classmates and I looked back at our lengthy list of vocabulary and information, we were overwhelmed. Much to our relief, our teacher told us a week ahead of time that we could make and use a 3x5 notecard on the test! Whew! You could feel the sigh of relief leave the classroom. But what should we put on it? What is really the important information? How will we all fit it on the card? My friend Allison had it all figured out. She organized her card by body systems. There was a section for respiratory, circulatory, muscular systems to name a few. The notecard was typed in size 8 font in order to fit as much information on it as possible. She italicized, bolded, and underlined to separate information to better find it during the exam. Little did she know, a miracle would happen! When she took the exam, she hardly used the notecard at all! As it turns out, she spent so much time digging through the information, deciding what was important and how it related to other topics, that she ended up LEARNING it. This is my motivation for giving you this 5 Strategies to Review for Exams in lieu of a study guide. You see, if I give you a study guide, I take away your opportunity do as Allison did. She learned a valuable lesson of life: how to organize and sort through information. In so doing, she also relearned the material which is the essence of a study guide anyway. These strategies are in no particular order, however, #1 should really come first. 1) Get Organized: Throughout the semester, some of us just throw papers into random binders and notebooks. * If this is the case for you, then this is your first step. Make a pile for each course. Go through all of your binders, notebooks, folders, etc and put papers into the piles noted for each course. Once that is complete, organize each pile into logical piles. These may include: notes, handouts, homework, assessments, projects, etc. *If this is not the case for you, then you can skip this step. 2) How to determine what is on the exam: I hear many students say they need a study guide to determine what is on the exam. If the exam is cumulative, meaning it covers everything, then EVERYTHING you just organized is fair game. This can be overwhelming to think about. So to help narrow it down, look at your grades online! 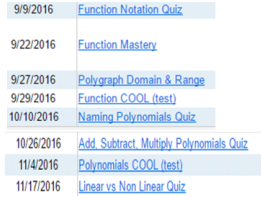 For example, this student learned about function notation, functions in general, domain & range, naming polynomials, how to add/subtract/multiply polynomials, and determine if a function is linear or non linear. All of this can determined by looking at the list of assessments. To analyze this list even further, notice the dates. Generally speaking, when a teacher writes an exam, it is proportional to the amount of time spent on a topic. Assuming the school year started in the middle of August, it looks like Functions took about 6 weeks. This is in contrast to Polynomials which took about 3 weeks. Therefore, there should be about twice as many Function questions as there will be Polynomial questions. Knowing this type of information can help you determine your focus. 3) Where can I get sample questions for the exam: Again, analyze your grade. What assignments were given? What pages? What questions? Finding these assignments are a great place to start determining what types of questions are asked on each of these topics. Also, your old assessments are a great resource. Many teachers use old assessment questions to create the exam. 4) Easy vs Hard: This is still a lot of information. So now it is time to prioritize. As you go through all of these sources, start making a list of what topics are EASY for you and which ones are HARD. When it comes time to study, spend your time on the topics that give you the most trouble. Then if you have time left, you can use it to review the easy topics. 5) Be Active: To truly review successfully, you have to be an active participant. As you work through the strategies above, generate your own study guides or use the templates provided to you. Actively engage yourself in the process rather than passively reading through your notes. Focus on what you need the most. Work your way to being like Allison who ended up not needing her cheat sheet. Because, after all, there are many situations in life where you just have to know your stuff and not be reliant on looking it up. Once I go over these strategies with my students, I give them time to choose one of these templates to fill out. 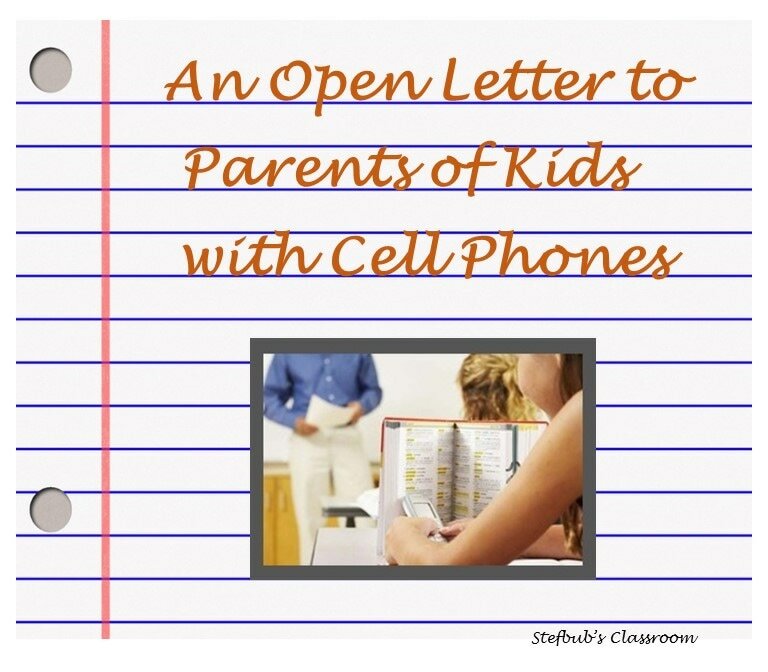 It gives them a guided and structured way of making their own study guide! ​And there you have it. While you review with your students, build in study skills. How do YOU review and/or teach study skills to your students? Comment below. Are you ready to run the marathon of between Thanksgiving and Winter Break? You deserve to spoil yourself and your students with some great products from TpT during the Cyber Sale on Monday 11/28 and Tuesday 11/29! To help get your shopping started, I'm giving away a $10 gift card! Simply enter through the Rafflecopter below any time 11/27 - 11/28 until midnight EST. 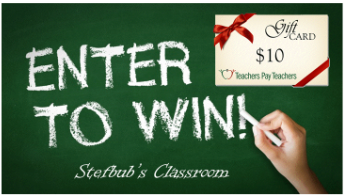 ​Once you have entered, head on over to Texas Teaching Gal for a chance to enter to win... again! This is a blog hop, so you can enter to win up to $260! The 2016 Olympic Games are upon us. Pokemon GO has been sweeping the United States. There is no doubt that games captivate our attention! As educators we often play games with our students, and many of us say these are some of our most engaging days. So from July 15 to July 24, I invite you to link up your favorite games to use in the classroom! (See the end of this post.) These could be described in blog posts and/or actual products. Please keep the focus on games to play with Grades 7 – 12. Links are placed in random order. 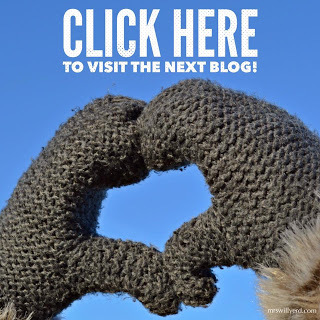 After linking up, please provide credit by adding a clickable link back to this website (www.stefbubsclassroom.weebly.com) on a blog post, social media, or on your product page but not your blog or shop itself. Finally, please participate in the spirit of the Olympic games and cheer each other on. Take some time to view other's links that interest you. Support each other by leaving comments, possibly following each other, and voting for your gold, silver, and bronze medal favorites starting July 17th! ...and as they say in Rio, Let the games begin!!!! ​Here I are my Top 4 favorite game and game strategies. Guess What? Graphing Game: This game is modeled after the classic game of Guess Who. It is a 2 player game (that can be modified for 3 players) where players take turns asking yes and no questions to isolate a graph. The first player to guess the other player’s graph wins! Each player takes their game board and places it in a dry erase sheet protector. Each player chooses a graph for which the other player will guess. Choose who goes first. That person will ask a yes or no question of the other player to try to narrow down the possibilities. As the player is able to eliminate possibilities, they can cross off that graph. Through process of elimination, players will eventually be able to guess which graph was chosen. There is one question per turn. I have a variety of graphs that students can play with including linear, systems of linear equations, and inequalities. ​Catch Phrase in the Classroom: In this blog post, I outline how I have used the “hot potato” game of Catch Phrase to practice vocabulary acquisition in my classroom. (However, this can be used in any subject.) Students love to come up with really creative ways to describe the given vocabulary terms. As they play, the teacher can take notes as to what terms they skip (they might need a review of that concept), what are common misconceptions (explain the term wrong or go about the explanation in a very random way), and which ones they describe quickly and accurately (good – they know it and you can move on). This classroom version of Catch Phrase is good for all grade levels and subjects. Kahoot! I could not get away from Kahoot last year! The structure is simple. The teacher enters multiple choice questions into the Kahoot website. Students use internet enabled devices to answer the questions. The hook is that students can see what their score is after every question, how the score compares to their classmates, and gain immediate feedback for accuracy. Then watch and listen to them beg for more. Game Board Templates: These templates are one of those things I have stashed away in a cabinet for an emergency. Simply do an image search for “game board templates”, choose your favorite, print them out, laminate, and save for when you need them the most. I have used them mostly in situations where students need a more interactive approach to practicing problems. I provide an accompanying worksheet of problems. For classes that are more cohesive, I let the groups decide on the rules. For less cohesive classes, I dictate the rules. Either way, adding in the competitive nature engages the students that much more in their assignment.